Elaine Vrba, 83, of David City(formerly of Schuyler) died Tuesday, May 24, 2016, at her home in David City. FOR A TIME OF REMEMBERING AND CELEBRATING HER LIFE. AT KRACL FUNERAL CHAPEL IN SCHUYLER FROM 2-4 P.M. SHARING STORIES AND MEMORIES OF ELAINE'S LIFE. 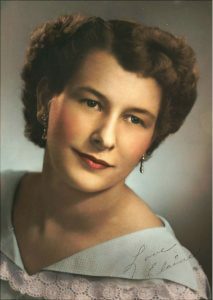 Elaine A. Vrba was born August 17, 1932, in Howells, Nebraska to Fred and Mary(Evert) Pieper. Following graduation from high school she married Charles Vrba on February 11, 1953, at the St. Mary's Catholic Church of Tabor, southeast of Howells. They lived and farmed north of Schuyler and Elaine was a true "farmwife" and homemaker. she also had worked at Don's Bakery, Didier Grocery and did catering with her sister, Joan Brichacek. In December of 2014, Elaine and Charles left the farm and moved to David City. Elaine is survived by her husband, Charles Vrba of David City, two daughters;Jacilyn Joaquin and Cindy(Rick) Olsen, all of Omaha, two sons;Charles J. and Robert(Darli) Vrba of Schuyler, five grandchildren;Joseph(Christiana) Vrba, Samantha Vrba, Mckayla Olsen, Ben and Jerry Vrba, two sisters; Lucille Jonas and Rosemary(Steve) Brabec of Clarkson. She was preceded in deathby her parents, two sisters;Lavina Langhorst and Joan Brichacek and son-in-law John Joaquin.